Gregory W. Lester, Ph.D., is a clinical, consulting, and research psychologist with practices in Colorado and Texas. 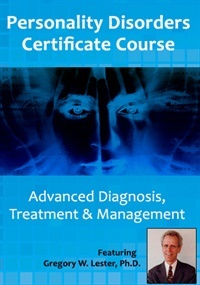 Dr. Lester has presented over 2,000 personality disorders trainings to over 200,000 professionals in every major city in the United States, Canada, and Australia.In his nearly 40 years of clinical practice, Dr. Lester has treated over 1,000 personality disorder cases and has performed psychological evaluations on over 2,500 individuals. Dr. Lester has served on the graduate faculty of The University of St. Thomas and as a special consultant to The United Sates Department of Justice. Dr. Lester’s office served as one of the original research sites for the DSM-5® revision of the personality disorders section where he collaborated with Emory University, the New York State Psychiatric Group, The University of Missouri, The University of Kentucky, and the late Dr. Robert Spitzer, chairman of the DSM-3 committee. Dr. Lester is a member of the American Psychological Association, the Texas Psychological Association, and the Colorado Psychological Association. He is the author of nine books, including Power with People, a manual of interpersonal effectiveness, Shrunken Heads, an irreverent memoire of his graduate school training, and Diagnosis, Treatment, and Management of Personality Disorders, which is the largest-selling front-line clinical manual on diagnosing, treating, and managing personality disorders. Dr. Lester’s research and articles have appeared in publications including The Journal of the American Medical Association, The Western Journal of Medicine, The Yearbook of Family Practice, The Journal of Behavioral Therapy, The Journal of Marriage and Family Therapy, The Handbook of Depression, Transactional Analysis Journal, Living Word Magazine, The Priest Magazine, and The Houston Lawyer. Financial: Gregory Lester is in private practice. He receives a speaking honorarium from PESI, Inc. Non-financial: Gregory Lester is a member of the American Psychological Association; the Colorado Psychological Association; and the Texas Psychological Association.